A rabbit hutch is a lot of things. It’s a house and home for your dearest furry friends, it’s a financial investment, and it’s part of the overall look of your garden. This makes for plenty of good reasons to keep hutches in good condition, making sure they stay solid and continue to look nice. Even so, a lot of people are lax about hutch care, and often this is because they just don’t really know where to start. Follow these steps for a relatively simple and low-effort, yet highly effective, wood care regime to protect and maintain your rabbit hutch. Choosing a good-quality hutch made of equally good-quality wood is the first step in making sure that your hutch will last a long time. The second step is ensuring you set it up properly. Make sure all joints are strong and firm, with pieces of wood up close against each other. Otherwise, water may seep into these gaps and, since protective treatments will likely not be applied well to these nooks and crannies, potentially find a way into the wood itself and encourage it to rot. Placing the hutch on slabs, gravel, or hard ground so it is not sitting directly on wet mud after rain will also help keep it in good condition. Even if the wood is in some way pre-treated, this will pale to the protection and preservation offered by a good-quality wood treatment. This will also give you a chance to give your hutch the look and style that you want. 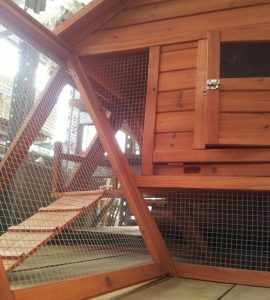 For example from Owatrol, a Solid Color Stain Paint (SCS) will give you a coloured opaque finish for your rabbit hutch in a range of colors, Tropitech will be a semi-transparent wood finish with amazing longevity, and Textrol will provide a saturating wood oil finish to show off the natural beauty of the wood. Whatever finish you choose, though, you will want to favor non-toxic treatments in case your rabbits decide to have a nibble. The treatments used may be suitable for either, but a rabbit hutch’s needs are quite different from those of a fence or a shed. In particular, it’s doubtful you’ll want to find somewhere else for your rabbits to live for a few days every single year while they wait for the treatment on their hutch to be properly dry. You will probably want to bear this in mind and apply some kind of particularly long-lasting protection. For example, you will most likely get five or more years out of a good coat of Solid Colour Stain or Tropitech in a sheltered area before you need to think too much about a fresh treatment, perhaps with some minor maintenance in between if necessary. You should regularly inspect your rabbit hutch and check its condition, ideally at least once a year. For at least the first couple of years, this will probably be little more than a way of developing good habits. Later on, it’s possible that a protective coat will have worn down unusually quickly due to harsh weather or exposure to the sun, that the felt on the roof of the hutch might need repairing or renewing, or that a fresh screw might be required to make a joint tight again. Catching these small problems early can prevent big problems later on.